Whether you were scrolling through your Facebook news’ feed or simply reading tweets about the most recent political scandals, chances are you have been exposed to contradictory information, and even ‘fake news’. On the internet, anyone can spread dishonest information to a large audience and promote their political agenda. Consequently, data journalism and anti-corruption organisations have grown significantly over the past years. ProPublica, a non-profit news organisation, uses data and investigative journalism to spur social reforms in the United States. datafication as a legitimate means to access, understand and monitor people’s behaviour is becoming a leading principle, not just amongst techno-adepts, but also amongst scholars who see datafication as a revolutionary research opportunity to investigate human conduct (198). However, data are not without ambiguity. The creation, collection, analysis and interpretation of data are biased and carry consequences. Therefore, data re-purposing is essential to limit political and financial corruption. ProPublica’s website features two main tabs; ‘Series’ (investigations and ongoing news reports) and ‘News Apps’ (applications, graphics, databases and tools). It recently launched ‘Nonprofit Explorer’, a web-based application which allows users to browse raw data from tax-exempted non-profit organisations. 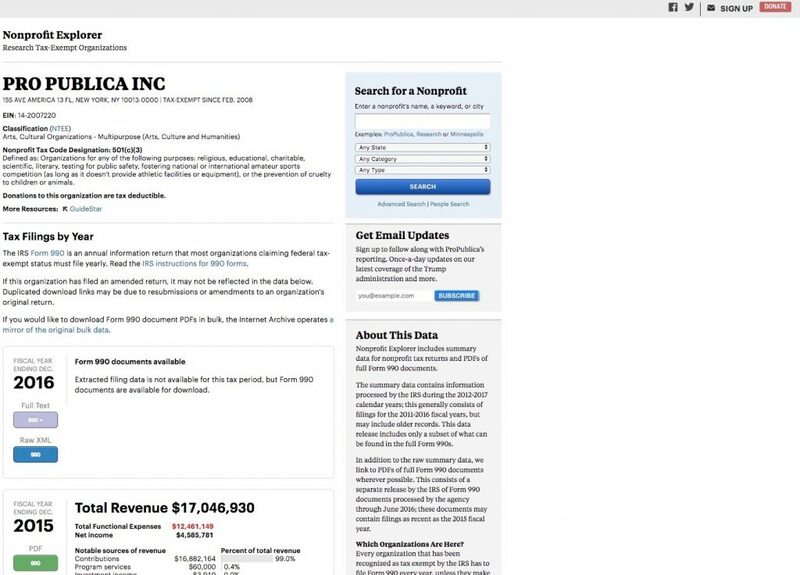 Searching for ProPublica will lead you to a page detailing the organisation’s total revenue and tax returns. In 2015, it received $500,000 in donations (Mullin). During the 2016 Presidential election, this number soared to an undisclosed number. Donations are even encouraged on the website by the presence of a red button. ProPublica also accepts sponsors through advertisements. Nonetheless, the news organisation claims to use programmatic advertising—meaning that they are not in direct contact with the advertising companies or organisations (ProPublica). During its investigation of Facebook, ProPublica identified data about abusive age-targeted advertisements. On December 2017, Facebook responded to ProPublica’s accusations. Rob Goldman, the vice-president of ads, issued a statement on Facebook’s newsroom entitled “This Time, ProPublica, We Disagree. Our view on age-based targeting for employment ads.” He claimed that the data had been misinterpreted. A year later, ad targeting, privacy, and hate speech were among the topics thoroughly discussed between the Facebook CEO and the U.S. Congress. Mark Zuckerberg even mentioned ProPublica during the hearing. Since its creation in 2007, ProPublica has thus become an effective model for investigative journalism in the digital world. It labels itself as a watchdog, a counter-power whose mission is to provoke change. With ‘impact’ as a motto, its mission is to use investigative journalism, not only as a mean to expose corruption and misuse of power, but also to ‘spark real-world change.’ ProPublica has been recognised by both traditional media and new media with awards such as Pulitzer Prizes, Online Journalism Awards, Digital Interactive News Story Awards, and more. Its innovative and transparent use of data in news reports and social projects bring awareness to the way knowledge is produced online. The organisation’s data store acts as a safeguard for democracy by giving the public free access to raw data. Data is used as a tool for anti-oppressive knowledge production. Since there is no capital interests in attracting traffic to the website, ProPublica claims that journalists can focus on uncorrupted and reform-oriented news reports. For instance, ‘Documenting Hate’ is a project that gathers data and verifies reports for journalists, researchers and civil-rights organisations. ProPublica thus provides alternative ethical positions against oppressive paradigms. As there is no exact way of measuring journalism’s impact. ProPublica uses simple methods such as listing the positive results of its reports. 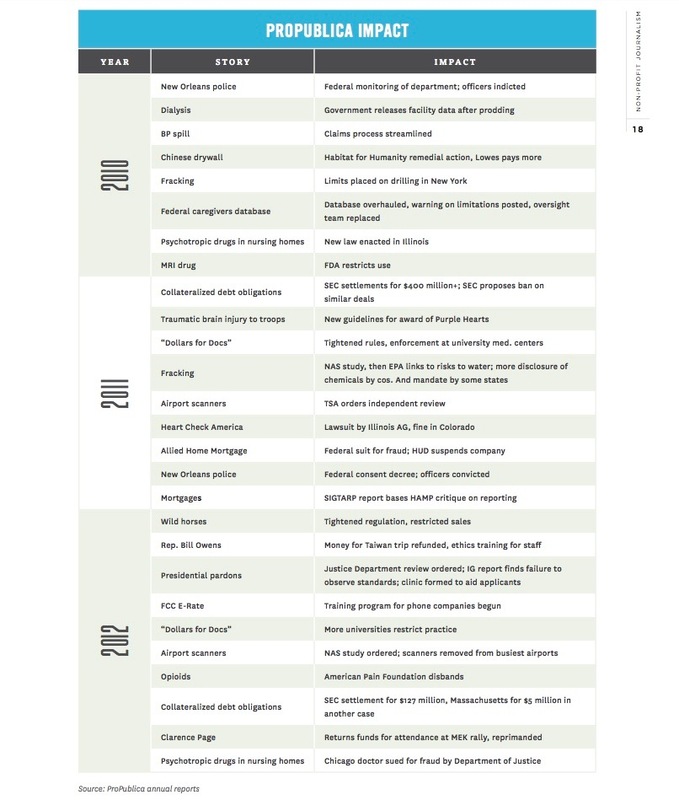 In 2015, ProPublica released the “Surgeon Scorecard”. It analysed the performance rate of 17,000 American surgeons. The aim was to help people find the right surgeon, using data previously restricted by government agencies. It was widely criticised for its methodology in a Rand report. The Scorecard turned out to have poor measurement reliability, in part due to “the inadequacy of the underlying data” (Friedberg et al. 4). Yet, ProPublica’s failed attempt at analysing data did participate in the push for more transparency and accountability in the health sector. There is therefore some social value in flawed data reports. Journalists, researchers and the public can engage in human ethical conversations (O’Neil) to improve the creation and manipulation of data sets. All in all, ProPublica is an example of how re-purposing of data can enable change and challenge abusive powers. It allows people to actively participate in the news and knowledge making process. By encouraging us to question the dynamics of power, it ultimately seeks to make us act on our knowledge. Data is used as a valuable—but not infallible—insight. Despite the possibility of generating new revenue with the sales of datasets, ProPublica seems to be focusing on advocating social reforms. With other organisations such as The Center for Public Integrity and Transparency International, journalism seems to be heading towards the more ‘transparent’ non-profit investigative method of reporting. This raises questions about the digitization and ethics of journalism, as well as the methodology of data analysis, and the impact of popularisation and democratization of data. Dijck, José van. 2014. “Datafication, dataism and dataveillance: Big Data between scientific paradigm and ideology.” Surveillance & Society 12 (2): 197-208. Friedberg, MW, Pronovost PJ, Shahian DM, et al. A Methodological Critique of the ProPublica Surgeon Scorecard. Santa Monica, CA: RAND Corporation;2015. http://www.rand.org/pubs/perspectives/PE170. Goldman, Rob. 2017. “This Time, ProPublica, We Disagree.” Facebook Newsroom. 21 September 2018. https://newsroom.fb.com/news/h/addressing-targeting-in-recruitment-ads/. Jacobson, Ralph. 2013. “2.5 quintillion bytes of data created every day. How does CPG & Retail manage it?.” IBM. 21 September 2018. https://www.ibm.com/blogs/insights-on-business/consumer-products/2-5-quintillion-bytes-of-data-created-every-day-how-does-cpg-retail-manage-it/. Kitchin, R. 2014. The Data Revolution: Big Data, Open Data, Data Infrastructures and Their Consequences. 1 edition. Thousand Oaks, CA: SAGE Publications Ltd. Chapter 1: Conceptualising Data. Leurs, K. and Shepherd, T. Datafication & Discrimination. In The Datafied Society: Studying Culture through Data, edited by Mirko Tobias Schäfer and Karin van Es, 211-234. Amsterdam: Amsterdam University Press, 2017. Mullin, Benjamin. 2016. “ProPublica is seeing a surge in donations after John Oliver’s Trump segment.” https://www.poynter.org/news/propublica-seeing-surge-donations-after-john-olivers-trump-segment. O’Neil, Cathy. 2016. “How to bring a better ethics to data science.” Slate, 4 February: http://www.slate.com/articles/technology/future_tense/2016/02/how_to_bring_better_ethics_to_data_science.html?via=gdpr-consent. ProPublica. 2018. Data Store. https://www.propublica.org/datastore/. Accessed 21 September 2018. ProPublica. 2016. Nonprofit Explorer. https://projects.propublica.org/nonprofits/organizations/142007220. Accessed 22 September 2018. ProPublica. 2018. Terms. https://www.propublica.org/datastore/terms. Accessed 22 September 2018. ProPublica. 2018. Documenting Hate. https://projects.propublica.org/graphics/hatecrimes. Accessed 22 September 2018. Schäfer, Mirko Tobias and Es, Karin van. “Foreword”. The Datafied Society: Studying Culture through Data, edited by Mirko Tobias Schäfer and Karin van Es, 11. Amsterdam: Amsterdam University Press, 2017. Wei S, Pierce O, Allen M. Surgeon scorecard. Online tool. ProPublica, 2015. https://projects.propublica.org/surgeons/. Accessed 22 September 2018.